Tolko’s Lavington, B.C. sawmill has recently seen a major upgrade that positions the operation well as lumber markets move in a healthy direction, with increased lumber demand, both in North America, and overseas. Read about the major improvements at the Lavington mill beginning on page 14 (Photo of Tolko mill by Paul MacDonald). Canada’s forest industry will have to implement various approaches to attracting, recruiting, developing and retaining a skilled workforce—and it can learn from other industries and companies, from Apple to Telus, on how to do this. 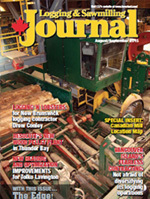 Resolute Forest Products recently re-started its Ignace, Ontario sawmill, having invested $10 million on improvements, with a strong focus on the infeed area so that the mill can now receive cut-to-length logs exclusively. Tolko Industries’ Lavington, B.C. sawmill has undergone a significant upgrade—involving installing a new headrig from Salem Equipment and associated controls from USNR—that has delivered a solid improvement in recovery. Dale Crumback has recently moved from sawyer to company owner at B.C.’s Rain Forest Sawmill, and things are hopping these days with a wide range of customers looking for a variety of wood produced from their biodiesel-powered Wood-Mizer LT 70 sawmill. New Brunswick logging contractor Drew Conley juggles running a logging operation—with most of the wood going across the line, to Maine—with helping out in the family fishing outfit, catching lobster. Resolute Forest Products recently completed construction of a $9 million wood pellet plant in Thunder Bay to supply Ontario Power Generation’s power plant in Atikokan with wood pellets as a fuel substitute. One of the primary motivations in establishing the CVWPA woodyard was to diversify wood product production and, in turn, supply diversified markets. Vancouver Island’s Fearless Contracting is finding the best business approach is diversification, and as part of that, it is increasingly doing logging work on B.C. Timber Sales, for other larger logging contractors, and for log brokers on the Island. 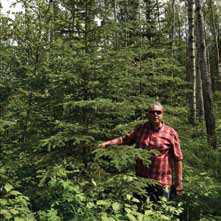 Included in this edition of The Edge, Canada’s leading publication on research in the forest industry, are stories from the Canadian Wood Fibre Centre and Alberta Innovates - Bio Solutions. With the federal election coming up, Jim Stirling says there may be a mood shift underway with voters, which could yield some surprising results. The Silviculture and Afforestation Group (SAG) has now set its sights on demonstrating various site rehabilitation techniques and tools to bring a variety of previously productive forest lands—such as mountain pine beetle-infected stands as well as oil and gas sites and roads—back onto a successful commercial forest recovery trajectory. CWFC - SAG leader Derek Sidders stands beside 15-year-old white spruce growing in an area site prepped using a Meri Crusher tool. This is the next step in a successful partnership with industry to demonstrate innovative and systematic harvesting techniques to economically recover wood from small parcels of mountain pine beetle-infected stands. Potential target sites for rehabilitation treatments are sites that previously had productive forest lands and are now being reclaimed, as well as forestlands severely impacted by the beetle. Ultimately, application of these demonstrated rehabilitation strategies will benefit the Canadian forest industry by bringing more of the land base back into commercial forest production. SAG has partnered with forest company Canfor and the Forest Resource Improvement Association of Alberta (FRIAA) on a 350 hectare rehabilitation project in Alberta. It also has a rehabilitation project in Ontario. Both projects demonstrate innovative site rehabilitation operations that maximize the establishment of crop tree species. A key component to the site preparation techniques being demonstrated are the tools being deployed to bring about the best rehabilitation results. The tools being deployed by SAG can be mounted on an excavator using a quick attach, with the goal that the use of these tools and techniques should be quick and easy, using prime movers readily available in day-to-day forest industry operations. Based on long term growth response studies where the selected tools for this project were deployed back in the 1990s, they delivered impressive results. “Long term growth response studies associated with use of these tools have shown 20 to 30 per cent increases in growth and survival,” says Sidders. A high speed, horizontal mixing, site prep technique was applied on the Alberta demonstration site north of Spirit River, using a hydraulically-powered, 1.4 metre wide mixer called a Meri Crusher mounted on an excavator. The Meri Crusher tool was tested and demonstrated in the mid-1990s by SAG and its partners across Canada. The tool has been adapted for use in this SAG rehabilitation project to minimize vegetative impacts on crop trees, to enhance the growing environment, and to reduce costs of actual planting. An elevated bed mixing tool called the Grizz, which was also developed in the 1990s, is now being redeployed as part of this project for selective use for both rehabilitation and application in shelter wood systems. Sidders says the advantages of using these innovative tools and techniques is that they can create selective patches of various sizes to meet local ecological conditions and spacing requirements on sites that are either under partial harvest or have unique characteristics associated with displacement of soil materials resulting from resource extraction. The goal is to re-establish native crop trees, primarily tolerant softwoods, while maintaining or enhancing the integrity of the local environment. In future, the techniques will be demonstrated on oil and gas disturbed sites and sites disturbed by other land uses, such as road access and industrial development. The next SAG Edge article will take a more detailed look at the rehabilitation tools and site preparation techniques used as part of this project. For more information about this project, contact Derek Sidders at (780) 435-7355 or Derek.Sidders@NRCan-RNCan.gc.ca. The Municipal Airport was a fixture north of Edmonton’s downtown for nearly a century. Now the 217-hectare former airport site is being transformed into one of the world’s largest sustainable redevelopment projects. Once completed, the Blatchford Redevelopment Project will be home for 30,000 people. Mark Hall, the project’s executive director, presented an overview of this unique development to about 300 attendees from 19 countries at the Modular and Offsite Construction (MOC) Summit held recently in Edmonton, an event co-sponsored by Alberta Innovates Bio Solutions (AI Bio). Using more wood as a building material and constructing highly energy efficient buildings will help the City of Edmonton achieve its green building goals for the site, and create a smaller environmental footprint, says Hall. The city is constructing all the “horizontal” infrastructure at Blatchford and intends to sell fully-serviced sites to private developers. Edmonton recently joined Calgary in allowing six-storey, all-wood building construction for multi-residential buildings, and Hall says this change will likely have a significant impact on how much wood is used in the overall project. He says the city is aware of innovative new wood products now available to builders. With recent code changes to permit six-storey, all-wood construction, he expects that some will take place at Blatchford. “We know that there is a price advantage of wood over concrete or steel, especially going up to six storeys, on a per-square-foot basis,” he says, adding that developers have responded positively to the decision to allow taller wood buildings. The city has designed some of the zoning in the Blatchford redevelopment to align favorably with six-storey, all-wood construction. AI Bio—whose mandate is to help increase economic activity in Alberta’s agriculture, food and forest sectors through research and innovation—is investing in the research and development of innovative materials and building systems that promote new ways of using Alberta’s renewable forest resources. Hall says the project is moving forward quickly. The city is issuing a request for proposals (RFP) this fall, asking residential developers for building proposals framed around its environmentally friendly criteria. A similar process will take place for commercial and retail development at a later date, for approximately 1.5 million square feet of commercial/retail space planned for the site. “We will put out an RFP for builders that shares the vision for Blatchford in terms of the environmental and social objectives we have,” says Hall. The city is using an “energy intensity” code for the development, challenging builders to design residential units that only consume a set maximum amount of energy per metre per year. It will be up to the developers how they choose to meet that objective and what building materials they use. Hall says that will be a topic of discussion with the developers once they are selected. The Northern Alberta Institute of Technology (NAIT) is located next to Blatchford. Part of the overall plan is for NAIT to expand and consolidate its presence onto the site’s southeast portion, Hall says. He adds that there are opportunities to integrate NAIT’s trades and alternative energy program with the Blatchford redevelopment project down the road. Hall has toured the Blatchford site with representatives from Alberta Wood WORKS! and the Alberta Forest Products Association, initially to discuss recycling opportunities for wood buildings being demolished on the airport site. This has opened the door to an ongoing discussion on how innovative wood building products could be used in the Blatchford redevelopment going forward, he says. Planners for the Blatchford Redevelopment project are creating opportunities for more wood use in multi-residential housing on the Edmonton site. 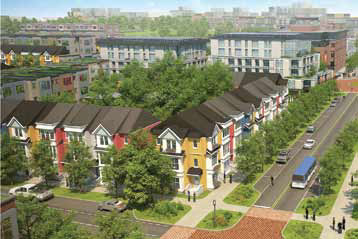 (Rendering - City of Edmonton). For more information about the Blatchford Redevelopment Project, visit www.edmonton.ca/blatchford.aspx. For more information about AI Bio, visit bio.albertainnovates.ca.